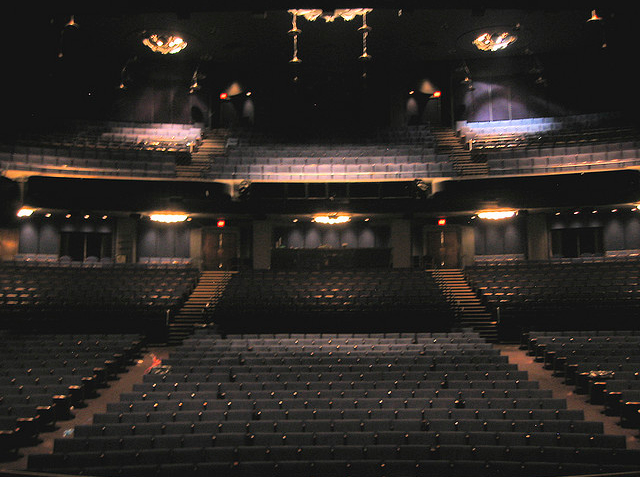 Theatres are considered to be some of the most haunted places in the world. When you think about it, that makes sense! There is so much energy in theatres, including electrical energy with lights and sound along with physical energy from actors and audience members. Actors use a tremendous amount of energy into their performance regardless whether they are singing, dancing, or performing a monologue. The people in the audience also give out energy in their applause as well as their laughter and tears. What results from the combination of energy from these two sources is an abundant source of energy for the other side. Then add in the electrical energy, and you have the ingredients for not only a place for spirits to go where they can be entertained, but also have enough energy to manifest. Here in this article, we will introduce to you ten haunted theatres in the United States. There are a few we have personal experience in, while others we have found through research and the testimony of others. What theatres do you know of that are haunted? Let us know in the comments! Located in New York, NY, the Gershwin Theatre has been home to the show, “Wicked” for quite sometime. Opening in November 1972, it is one of the younger theatres on Broadway, but it doesn’t mean that the theatre is any less haunted! According to reports from “Wicked” cast members, there are three ghosts that haunt the theatre. One of them is known as “Drew” or “Dennis”, and the other two (though not named) ghosts are only known by their clothing. One wears a blue 19th century style suit and the other wears a white t-shirt. People have been tapped on the shoulder as well as unidentified actors being seen on stage and then disappearing behind a curtain. It seems the ghosts want their time on stage too! If you’ve never had a chance to meet Judy Garland in person, rumor has it you can meet her in spirit at the Palace Theatre in New York City. The venue started off as a vaudeville house in 1913 and then became the hottest place to perform for touring singers, dancers, and comics. Singers like Judy Garland and Ethel Merman performed as well as Will Rogers and Harry Houdini. 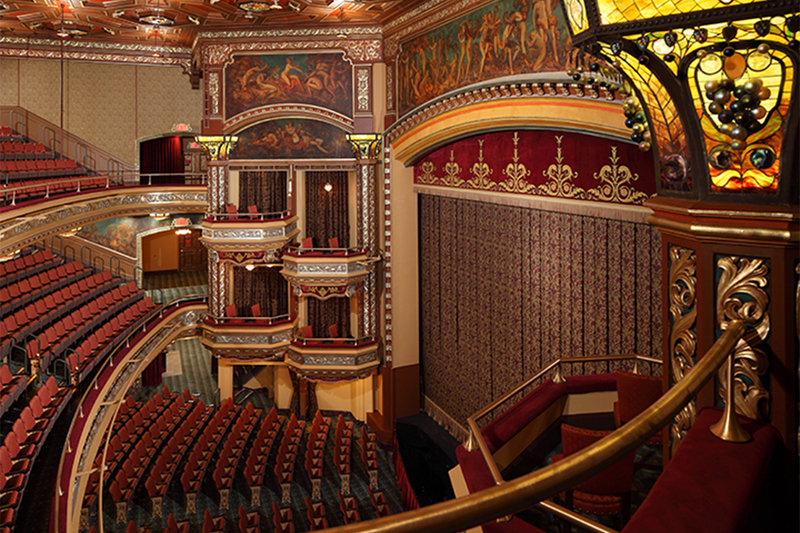 The Palace is said to be one of the most haunted theatres on Broadway and the spirits who haunt the building include a tightrope walker (who foretells the viewer’s death), a child in the mezzanine who plays “peek-a-boo”, a musician dressed in white in the orchestra pit, and a figure who passes through doorways late at night. The Carolina Theatre opened in Greensboro, North Carolina on Halloween night in 1927, and it was billed as “The Showplace of the Carolinas.” The theatre was originally built as a vaudeville theatre that could seat 2,200 people in the audience. However, as time passed, the theatre went through a period of decline before being saved from demolition and reconstructed to fit 1,200 people in 1977. But then, tragedy struck in 1981 when a fire started in the stairwell that once led to a segregated balcony. It is rumored that a woman, who was not supposed to be there, started the fire and it ended up killing her. She makes her presence known by moving the seats up and down. The theatre was closed for a year for repairs and reopened with seating at 1,075. Today, the Carolina Theatre is a fully functional performing arts facility! The Belasco Theatre in New York City was originally built in 1906 and owned by a man named David Belasco, known as the “Bishop of Broadway.” He was such a lover of theatre that he spent pretty much all of his time at the theatre, and even converted the attic into a penthouse. Rumor has it that he even removed some of the floorboards so he could watch rehearsals. On May 14th, 1931, he passed away, but he is apparently far from gone. He is said to be one of the most active spirits at the Belasco Theatre, with descriptions of sightings including seeing a dark figure watching the actors on stage, congratulating actors on a good performance, and even pinching the bottoms of women. If you look on Google, or even read this fine write-up by Ryan Sprague, you too will be convinced that there is something paranormal going on at the Belasco! If you’re familiar with any sort of history of the “Wild, Wild West”, then you already known that the Birdcage Theatre was an iconic landmark of the era with a saloon, brothel, and a stage. At least 26 people died in the theatre and there are over 140 bullet holes that plague the wall. 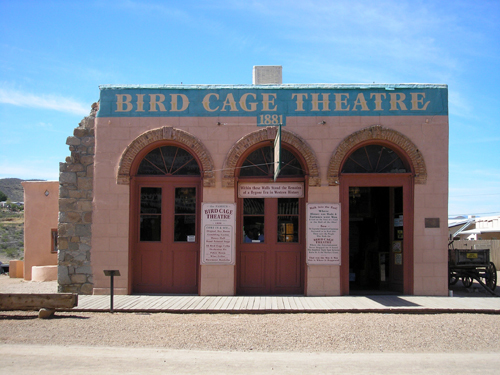 The Birdcage opened in 1881, and it is known as one of the most haunted buildings in Tombstone, Arizona. The theatre was open for 365 days a year and 24 hours a day, thanks to over 3,500 prostitutes that inhabited the town. Ghost sightings include men in cowboy hats as well as prostitutes, which makes sense and is contextual to the theatre’s existence. The Richard Rodgers Theatre currently is home to the smash Broadway hit, “Hamilton”, and is known for having some ghostly cast members. The theatre was originally built in 1925 and originally named, “Chanin’s 46th Street Theatre”, and after going through different ownerships and names, it was eventually named the Richard Rodgers Theatre in 1990 in memory of the iconic composer by the new owners, the Nederlander Organization. Paranormal happenings in the theatre include lipstick smudges in the women’s dressing room, stall doors opening by themselves, sightings of redheaded women, a howling sound after hours, shaking chandeliers, sightings of a child offstage, and things falling off the shelves. The Orpheum Theatre in Memphis, Tennessee was originally built in 1890 and then burnt down in 1923. The new building opened in 1928 and seats over 2,300 people and is listed on the National Registrar of Historic Places. According to rumors, the theatre is haunted by a little girl ghost named Mary. who was killed after being struck by a car nearby. Apparently she likes to play pranks on the living. People have reported hearing her giggle, walking up and down the aisles, and doors opening and closing on their own. A séance was also performed by the touring cast of “Fiddler on the Roof” in attempt to contact Mary and anyone else haunting the theatre. The New Amsterdam Theatre in New York is reported haunted by a former Ziegfeld Follies dancer named Olive Thomas. She performed with the Follies on the New Amsterdam main stage before becoming a film actress in Hollywood and marrying Jack Pickford, the brother of Mary Pickford. Then, Jack revealed that he had contracted syphilis and that Olive most likely had it too. Mary was soon found dead after supposedly overdosing on Jack’s medicine, mercury bichloride, which is lethal in large doses. Mary’s body was buried in the Bronx. After her death, people started to report seeing Mary in the theatre, which was impossible since she was already dead. Today, ghostly reports at the theatre include lights flickering, knocking, objects moving, cold spots, orbs, colored mists, and disfigured face in mirrors and windows. The activity was so rampant that Disney Theatrical Productions placed photos of Olive at every theatre entrance so workers can greet her, which has apparently helped in decreasing activity. The Lincoln Square Theater in Decateur, IL is known as one of most haunted places in the area, and perhaps even one of the most haunted places in the country. The theatre was built on the same grounds where a hotel burnt down in 1915, and the new theatre opened in 1916. The fire claimed two lives, but there were also hotel guests that were never accounted for after the fire, so the death toll could be higher. Starting in the 1930’s, ghost stories began to circulate. One of the most popular ghost stories is of “One-Armed Red”, who was a stage hand with just one arm from a war injury. While the rumors say he fell off a catwalk 75 feet above ground and got snagged by a hook and torn to pieces, Red actually died after falling asleep for a nap and never woke up. Encounters at the movie theater and performance space include footsteps, cold chills, hooded figures, a woman in white, and being touched by someone.